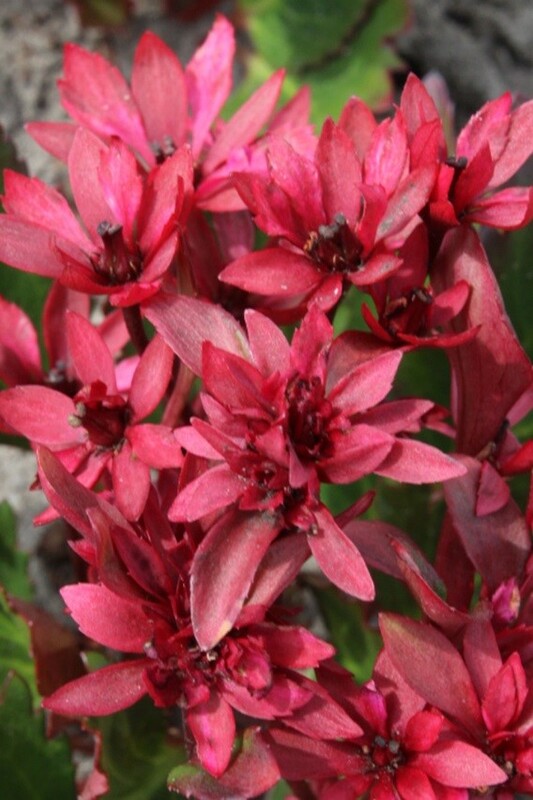 Mukgenia™ Nova Flame® is an intergeneric cross between Bergenia and Mukdenia ‘Crimson Fans’. An intergeneric cross is a very rare type of hybrid, formed between plants of two different genera. It is indicated by the symbol x before the genus name. The genus Bergenia was named after Mr. Karl von Bergen, born in 1704 in Germany. He was a medical practioner, and professor at the University of Frankfort at the Oder, and the author of publications on botany. He died in 1760. Bergenia is a vigorous perennial with thick rhizomes and large, leathery, evergreen leaves growing into a broad, dense clump. 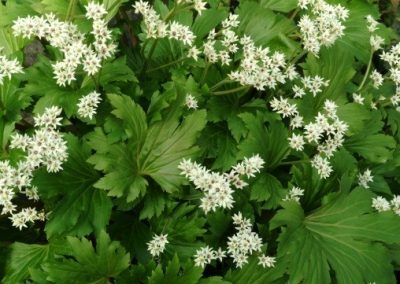 The genus Mukdenia was named after the North Chinese City, Mukden, where the genus was found. 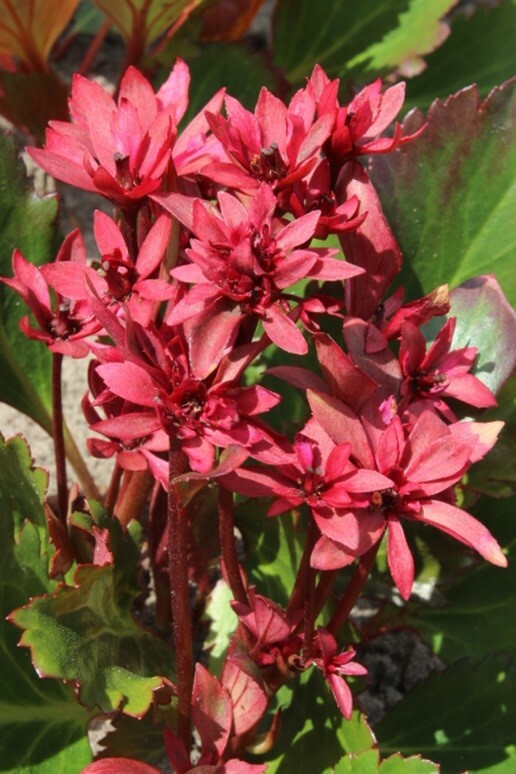 Mukdenia ‘Crimson Fans’ forms a low, spreading mound of large, bold, maple-shaped leaves which are bronze-green in spring. 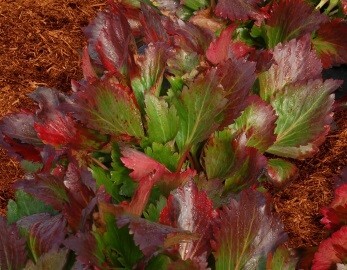 Red pigmentation begins to creep inward from the edges and by late summer they are fire red. x Mukgenia™ Nova Flame®, was successfully crossed by the well-known Terra Nova™ Nurseries breeder, Ms. Harini Korlipara. The hybrid exhibits heterosis(hybrid vigour). 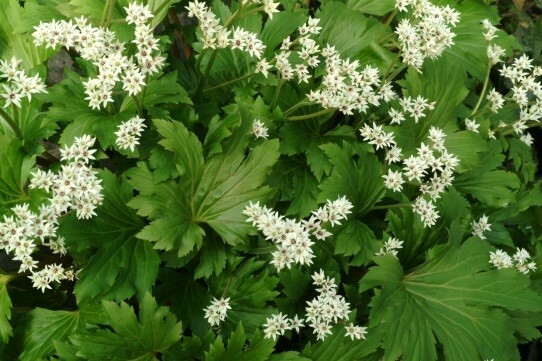 It forms low, compact mounds of shiny, leathery leaves with jagged edges. It is specially durable since it takes cold and wet weather well. It has great fall colour and is totally deciduous in winter. 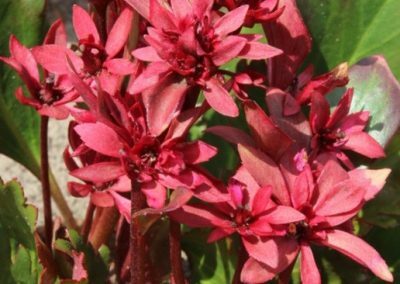 In spring it sports flowers that are midway between Bergenia and Mukdenia, sprouting in small, dark, rose- pink clusters. 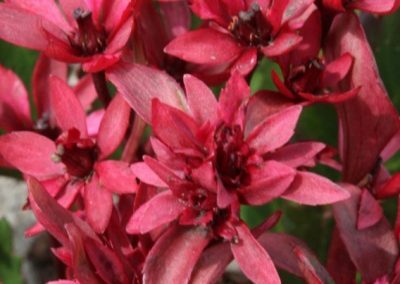 x Mukgenia™ Nova Flame® is an amazing, cool and lovely intergeneric cross, combining the dark pink flowers from the Bergenia side and the great fall colour from the Mukdenia ‘Crimson Fans’ side. The thick leathery leaves last longer than Mukdenia.